Hi, friends! 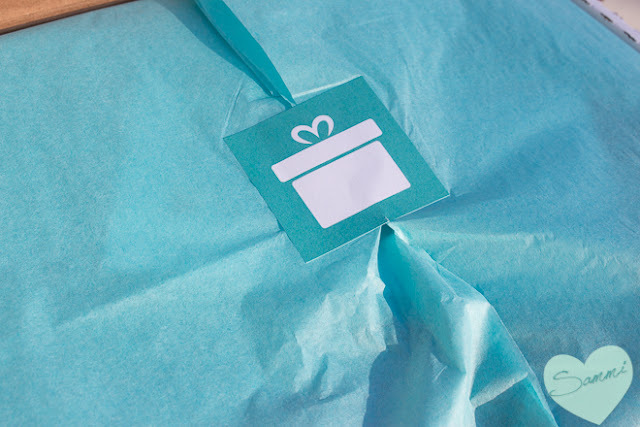 Today I have something a little different for you today: a food subscription box! I've subscribed to monthly food services before, but I chose not to share them on this blog since they weren't beauty related. But I've been wanting to broaden my horizons for awhile now, so I figured that this would be a good start. And besides--a beauty buff's gotta eat! Treats is a monthly food subscription service for snacks around the world. They give out finger foods like chips, cookies, candy from a different country every month. 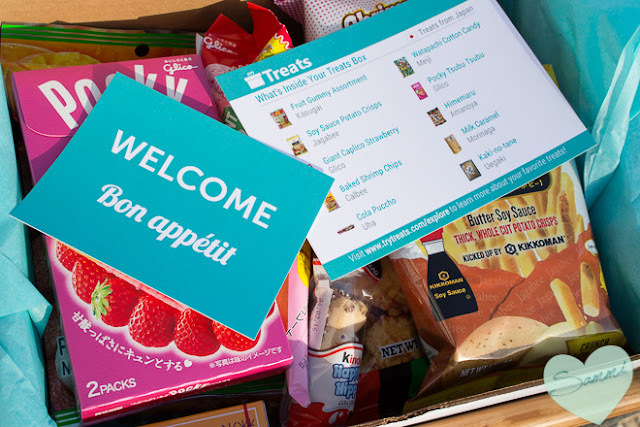 You can either subscribe to the Standard Pack, which is $13 a month for 4-5 snacks, or the Premium Pack, which is $25 a month for 8-10 snacks. 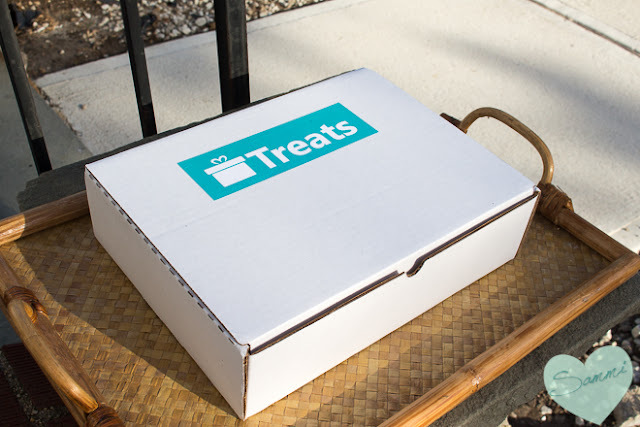 If you're interested in subscribing to Treats, you can use the code SAMMI for 15% off your first box! I was given the Japan Premium Pack for this review. I was really excited about it, since I'm a huge fan of Japanese food (I'm a relatively frequent customer at the nearby hibachi restaurant. I have a problem). The box comes with a theme card and an info card. I know subscription boxes that don't even provide that, so we're off to a good start! JAGABEE Soy Sauce Potato Crisps - These potato chips are really interesting! They taste like a thicker version of those tiny potato chip sticks, but they look like french fries! They're baked, not fried, but they have a buttery aftertaste. I don't think I would buy a whole family-sized bag of these, but they were fun to try. CALBEE Baked Shrimp Chips - The Japanese sure do love their baked potato chips! These were so freaky-weird. The bag definitely smelled like shrimp, but I didn't get too much of a shrimp taste in the chips. Maybe just a hint of shrimp, like the shrimp instant ramen. Again, not another snack I would stock up on for the winter, but I enjoyed them enough to eat the whole bag. GLICO Giant Caplico Strawberry - This is literally a packaged ice cream cone, without the ice cream. Instead, it's covered with what seems like a hardened strawberry "frosting". I wasn't a huge fan of this, but then again, I'm not a huge fan of fake strawberry (I will 100% of the time opt for chocolate). It was really funny to try--there's no way to eat it neatly without having it crumble and break off in your lap. I wouldn't buy one again, but I thought it was a cute idea. It just left me wishing for ice cream. MORINAGA Milk Caramel - I'm not a caramel connoisseur, but these tasted like any other soft caramel you would find in the U.S. That works for me! UHA Cola Puccho - These are by far the weirdest snack I received in this box. At first I thought they were soda-flavored gum, but then it really slowly starts to shrink in your mouth like a Starburst. I had my brother taste one and he's pretty easy to please when it comes to food, and even he wouldn't eat the remaining ones. Bonus: Kinder Happy Hippo - This wasn't on my info card, so I have to assume that it was a bonus extra. I don't know if all Premium Packs receive little extras or not, but I had to show it either way. I actually really love the Kinder brand, which is a German brand. It was killing me trying to figure out what this reminded me of, until I realized it tasted just like a Ferrero Roche chocolate! And then I found out that Ferrero is owned by Kinder, and all was right with the world. Not a Japanese item, but probably one of my favorites from the box. 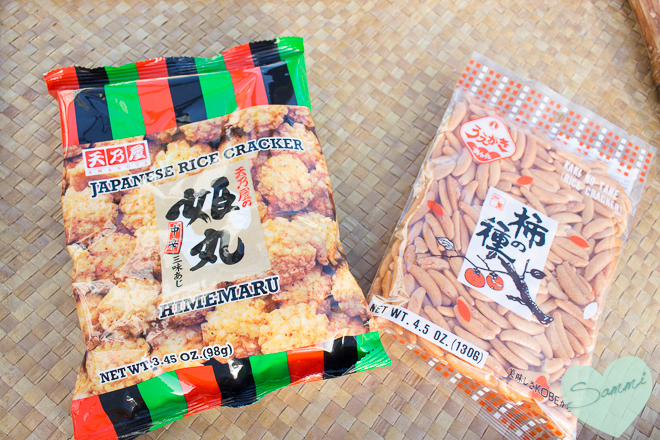 AMANOYA Himemaru - These were addicting! They weren't like the rice cakes you buy from Quaker in the supermarket, but smaller and crunchier. Probably my favorite from the box. I would buy a whole bag of these and eat them by myself. UEGAKI Kaki-no-Tane - The little rice crackers were great if you like crunchy things. However, they had a strange aftertaste that I couldn't get behind. I can't even identify it! Apparently these are a Japanese bar snack, meant to be eaten with beer (like the equivalent of peanuts here in the U.S.). It was so weird, because I loved the consistency, so I'd grab a handful and eat them, and then remember that I don't like the aftertaste. Oh well. GLICO Pocky Tsubu Tsubu - You can't have a Japanese box without pocky! These are little tiny biscuit/cookie sticks with a fake strawberry "frosting." I liked these more than the fake strawberry ice cream cone, though. The end of each stick also has a tiny pink heart on it. How cute! I'm always up for more pocky, though I do prefer the more common chocolate kind. KASUGAI Fruit Gummy Assortment - These were really good gummies! They're made with real fruit juice, and they reminded me more of Gushers than Gummy Bears because of how juicy they are. For some reason, they all come individually wrapped, which is convenient for me, but seems kind of costly for the company. 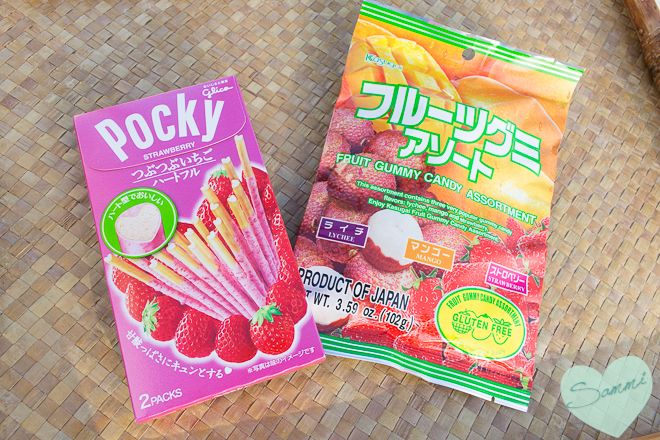 The three flavors--strawberry, mango, and lychee--all taste like their fruit counterparts, and I enjoyed them more than I thought they would. I would buy these again (especially since lychee is really hard to find in the U.S.). 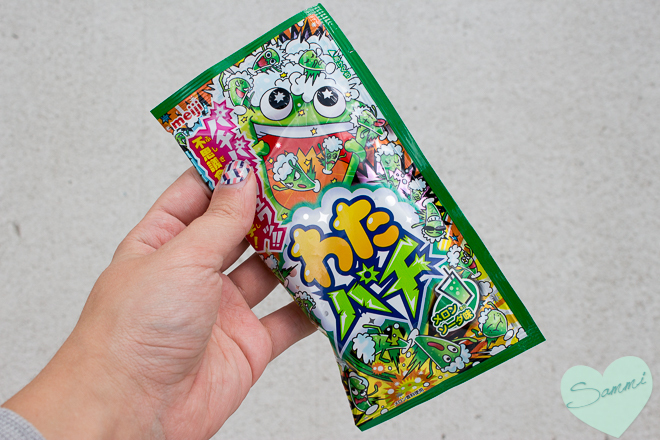 MEIJI Watapachi Cotton Candy - If packaged cotton candy and green apple Pop Rocks had a baby, this would be it. It comes in a very flat bag, so the cotton candy is very densely packed (moreso than American packaged cotton candy). And then when you put it in your mouth, you get a crackle-pop sensation (identical to Pop Rocks). It's a strange combination, but the Japanese are nothing if not creative. Apparently this is "melon soda" flavor, but it tasted really similar to green apple candy. I really don't like Pop Rocks, or green apple flavor, but my brother enjoyed the heck out of these. This was actually missing from my box when I first received it, so I contacted them and they shipped this out immediately! It's really good to know that if something goes wrong, their Customer Service is good. They get five stars! I felt bad not liking it after they sent it to me, but I'm glad they did! The Himemaru and the Pocky. Overall, this was a really fun experience! If you're close with a fellow foodie, I think they would have a good time trying out this box. 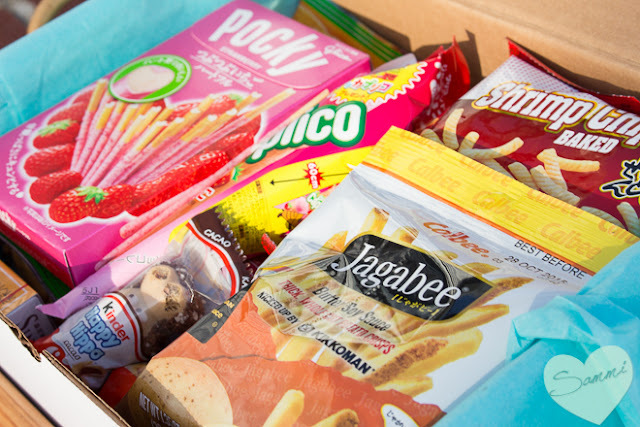 Even if I didn't love every item in this box, I still have fun tasting everything with my brother. 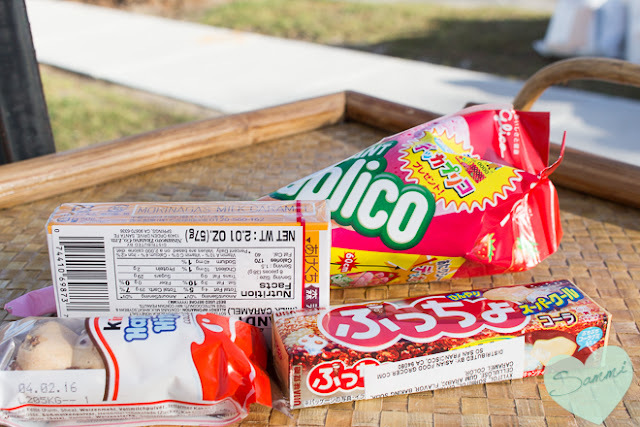 It also depends on what country the snacks come from--I know I happen to like a lot of Japanese foods, so this was a good match for me, but I don't like most Indian foods (I can't handle spicy). It's good to get a healthy dose of other cultures once in awhile! I won't be staying subscribed, mostly because I'm trying to eat healthier and stop snacking so much, but I think everyone should try it at least once! Have you ever subscribed to a monthly food service? What did you think? 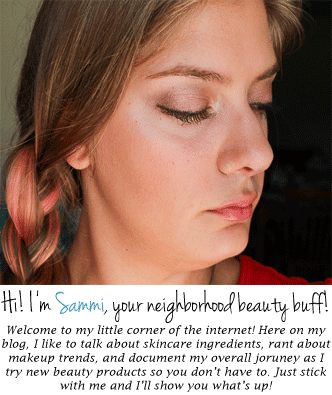 Want to see more subscription box reviews? Like what you see? Sign up for Treats! Disclaimer: Not sponsored. I received this complimentary in exchange for an honest review.